The domestic guinea pig (Cavia porcellus) and capybara (Hydrochoerus hydrochaeris) are fairly closely related and share many characteristics, down to the way they look. A few key differences distinguish them, however, including a massive difference in size. One is known for being a gentle pet, the other is a much larger version that wouldn't do well in captivity. Both the capybara and the domestic guinea pig belong to the family Caviidae in the order Rodentia, meaning they're both rodents and both cavies. The family tree branches off from there, however, as capybaras are in the subfamily Hydrochoerinae and guinea pigs are in the subfamily Caviinae. Other closely related rodents include chinchillas, nutrias, agoutis and porcupines. One of the biggest differences between the capybara and the domestic guinea pig is in their size. Capybaras are the world's largest living rodents, reaching lengths of just over 4 feet and over 100 pounds. Their smaller cousin, the guinea pig, reaches only about 8 to 10 inches long and weighs anywhere from 24 to 40 ounces. The guinea pig's small size is one of its assets as a pet. Capybaras also have partially webbed feet that aid them in the water. Both the capybara and the guinea pig are crepuscular, meaning they're active during dawn and dusk as opposed to at night or during the hottest part of the day. (Most rodents are nocturnal.) Both species prefer to live with other members of the same species, and in both species hierarchies are formed among the males. One behavioral difference is swimming: capybaras are just as at home in the water as they are on land and are strong swimmers who often seek refuge from the heat of the day by taking to the water. 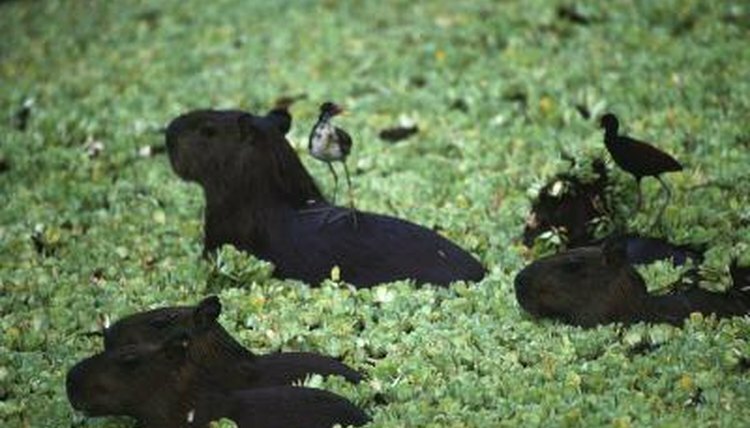 As such, capybaras inhabit only areas where water is accessible, such as marshes and flooded grasslands. Guinea pigs, on the other hand, inhabit a wide range of habitats in the wild, including rocky terrain and forests. Each of these animals is a favorite meat in its native land. While the guinea pig is no longer found in the wild due to captivity for the pet trade and for food, its close relative is. However, Peruvians also raise capybaras in captivity for their meat. In the wild, other species of guinea pigs are preyed upon by a variety of predators including canines, felines, weasels and raptors. The large capybara has few predators, although anacondas, caimans and jaguars are a threat. What Kind of Shelter Does a Koala Have?